This area is situated close to the Retiro park. 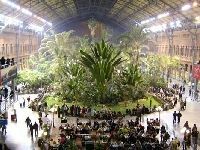 Sadly famous for the recent terrorist attack of the 11 March 2004, Atocha, is worth seeing even if you are not planning to take a train. Inside the station there is the original tropical garden, a few metres from the tracks; have a look at the glass roof. South of Atocha you will find Pacifico. A residential district, inhabited by military in retirement. Quiet with not too much traffic there is a good choice of shops and commercial activities in general. Well-connected to the underground, this area is close to Avenida de la Paz, the north-south motorway that takes you from one side of the city to the other in reasonable time.